Chonggu Si monastery, Yading, originally uploaded by jiulong. 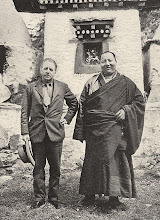 In 1928 when Joseph Rock reached the Chonggu Si monastery he had traversed the 'final' pass round the back of Shenrezig in torrential rain. He was disappointed to find that the monastery was much further beyond the pass than he had expected, lying at the bottom of what he called the Bonquende valley in larch forest. He reached this 'small and dilapidated monastery' after passing the lake beneath Shenrezig he referred to as Dutsu Kwa or Shenrezig's cup. In a section of his article entitled 'Taking Shelter in a Bandit Monastery', Rock describes how his party were "ushered into one of the stone buildings, black and dingy, word having been sent by [bandit chief] Drashetsongpen to take us in and extend such hospitality as the place afforded." "The caravan unloaded in the tiny courtyard in pouring rain while we entered the old building through a dark narrow corridor. On both sides opened small dingy smoke-filled rooms in which Tibetans were cooking over damp wood fires." "Since no white man had ever visited this weird spot, or any foreigner ever circumambulated these scared peaks these sacred peaks, a crowd of Tibetan bandit pilgrims, queer-looking men and women, had come to watch our arrival. They had climbed over the wall and stared at me, while others filled the courtyard to see this strange spectacle - the arrival of the first white man the roof of this monastery had ever sheltered. Their curiosity satisfied, the continued their pilgrimage, continually walking around the old monastery from left to right, chanting in unison." "I felt buried in these mountain fastnesses, icebound on all sides. The monastery was the rendezvous of all the outlaws and bandits, and perhaps some occasional genuine pilgrim of the surrounding no-man's land. 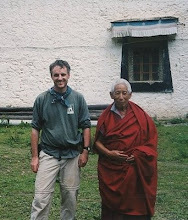 My lama guide tried to persuade me not to stay longer than a day and wanted to move on the next morning, but I demurred. 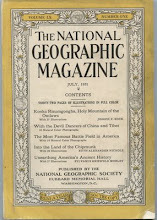 Had I not come to photograph and map the sacred peaks, to collect the flora and fauna of this unknown region?" Rock describes how the weather turned better during his three-day stay at Chonggu Si, and he went out in the sunshine the next day to try take some photographs of Shenrezig. However, he didn't get very far up the hill before his Tibetan bodyguards caught up with him and surrounded him, brandishing their loaded rifles. They told him he had had a lucky escape as he would surely have been murdered if caught outside by himself. They took him back to the safety of the monastery and warned him not to go out alone again. Joseph Rock pottered about in the monastery, but the monks in residence there could not tell him how old it was - at least over 100 years old was the best they could say. He noticed that one temple room contained an "obscene" many armed statue, and outside the pilgrims had left items of clothing and jewellery ("bracelets, rings, beads, feathers, bells - even hair) as offerings. "There was nothing beautiful whatever, only filth and evil smells. The few praying lamas were dressed in rags shiny with yak butter, for their robes serve as towels as well as handkerchiefs." Another building at the monastery contained a prayer wheel, and a fresco portraying the trinity of deities (Jambeyang: 'The God of Learning', Chanadorje: 'The Holder of the Thunderbolt' and Shenrezig: the Dalai Lama) said to be represented by the scared peaks. "An ever moving stream of pilgrims entered the little house, gave the prayer cylinder a complete turn, and then moved on, continuously circumambulating the sacred buildings." Joseph Rock also notes that there were some nuns in residence at the Chonggu Monastery, although he says that these "lean, lanky toothless old creatures" had the same shaven heads and the same filthy clothes as the monks, and it was impossible to tell the nuns from the monks until they spoke. As can be seen from his writings, Joseph Rock found the Chonggu Si monastery to be a disagreeable place - the smoky rooms and the stink form the stables sent him on his way earlier than he planned. He made a second visit to the peaks in August of the same year, but this was the middle of the rainy season, and he saw little in the way of mountain scenery. He had been planning to make a third visit, but was told by the Muli king that this would be suicide. There had been an unseasonal hail storm after his most recent visit that had ruined the local barley crops. This the bandits and outlaws had attributed to the mountain gods being angry at the visit by an outsider, and they had vowed to kill him on his return. Rock never went back to the Konkaling, "and thus the land of the Konkaling outlaws is again closed, and their mountains remain guarded as of yore." "I was led over a steep stairway to the left into a fairly good room - for that part of the world. It was the best the monastery could afford and was evidently the quarters of Living Buddha. The ceilings and walls were painted, and at the head of the room was a throne and a bed, above which hung some Tibetan scrolls, representing Tsongkapa, the founder of the yellow sect. To my left, a door led into a tiny private chapel, wherein reposed the tutelary demon of the Buddha. From below, juniper incense seeped into my glassless and paperless window and through every crack and crevice in the floor." I paid another visit to Chonggu Si, and found the monks to be friendly, if a little bored of all the tourists trotting through their courtyard. They did not seem very other worldly. During my visit the abbot of the monastery was doing his laundry outside in the yard using a cheap modern Chinese-made washing machine that was connected up to a generator, and which he filled with water by hand. I had a look around at the freshly painted interior of the rebuilt temple, whose colours seemed so vivid compared to the faded and desecrated murals I found in the old prayer wheel room. These could have been the same ones seen and described by Rock.